Yadav on Friday joined the growing list of Indian players who feel 'SG Test' ball was not ideal, saying the bowlers are unable to run through lower-order when it gets old. 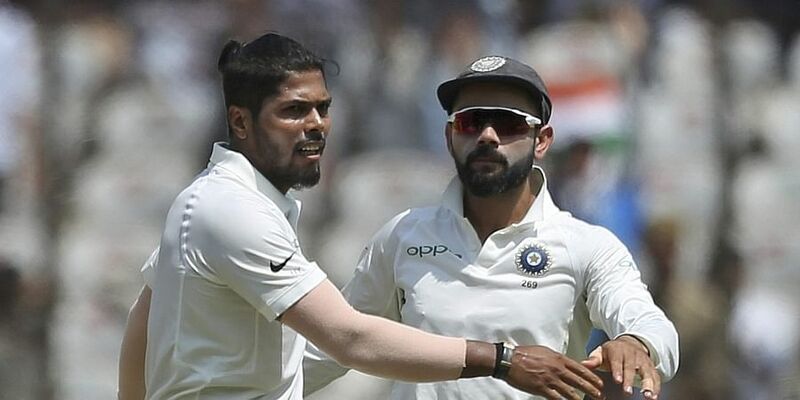 HYDERABAD: Speedster Umesh Yadav on Friday joined the growing list of Indian players who feel 'SG Test' ball was not ideal, saying the bowlers are unable to run through lower-order when it gets old. India skipper Virat Kohli has already advocated the use of hand-made Dukes from England. "If you are saying that lower order has scored runs, then you must realise that in India, with SG Test balls on these kind of flat tracks, you neither get pace nor bounce. So the option to use variations ends," Umesh said at the post-match conference. "So (with SG) all you can do is to bowl one spot but then you will realise that nothing is happening even off the pitch nor is it swinging. So when middle and lower order comes in they know that ball has become soft and it doesn't come at a pace and batting becomes easier," said Umesh, who had figures of 3 for 83 from 23 overs. "Tail-enders know that it will neither swing nor reverse. You just have to wait for something to happen and keep trying. But you can't really do it on such a big ground, the ones and twos keep coming. And West Indies' game is like that only," he sounded helpless. It was an exceptional effort from him on a flat track and he said that he was prepared for a long haul after Shardul Thakur's groin injury. "Had Shardul been there, it would have been more help for the spinners. Like I got three wickets and if he could have chipped in with a couple, it would have only helped our team. But you can't really do anything in these situations as this is part and parcel of the game." "If he (Shardul) is not there, I will have to bowl his quota of overs too and I knew he was not going to come back. I didn't want negativity to creep inside me that we are now one bowler short," the Vidarbha pacer said. Umesh said his strategy was to go for wickets rather than trying to contain which was not the best option on a big ground. "I decided that I had to take a chance. If I also try to contain runs, it will be difficult as the partnership (Roston Chase-Jason Holder) will only get bigger. So my aim was to get as many wickets as possible and I just tried. So it was something different that I tried," he said. "The conditions (for batting) were good and we neither had conventional swing nor reverse. The wicket was flat and it was such a pitch where you couldn't have contained runs. As much as you try, the scoreboard kept ticking as they got the singles and doubles," he reasoned. He has always got a raw deal in pacer-friendly conditions while toiling away manfully on dead sub-continental pitches but the Vidarbha pacer has no complaints about playing only his third Test of 2018. Couple of days back, bowling coach Bharath Arun termed him "unfortunate" while chief selector MSK Prasad's answer has been "workload management and rotation policy." Asked if it affects him that he has only been part of three out of the 10 Tests that India have played so far, Umesh gave a matter-of-fact reply. "If I keep thinking about the past, then I won't be able to focus on the future. It's past and I am looking ahead. I don't want to dwell on the matches that have gone by. My thinking is that I should try and perform well in the future matches and help my team," he said.